It’s only the most important homeschool document you’ll ever create! I have a few favorite resources that I know you’ll love. If you want to read my thoughts, my book, Homeschooling for College Credit, Chapter 7 is dedicated to the creation of transcripts specifically for families earning college credit in high school. It’s available in paperback or Kindle. My favorite GPA calculator is Back2College SUPER easy to use, I’ve used it for at least 5 years. Totally free, but it is really just a calculator. They use a standard 4.0 grading scale, so if you’re planning to use a different weighted grade scale, this isn’t the best site. My favorite ready-made transcript template is by How To Homeschool You can create a pdf document that can be printed or saved, all totally free! Uses a standard 4.0 grading scale. I’ve made my son’s transcripts using Microsoft Word and Open Office. I’m happy to teach you how to do it too in this free online course I created just for you! I balanced sharing my negative opinion vs. not saying anything at all, but I opted to share my opinion for this product because of the cost. The bottom line, if you shell out this kind of money, you’re going to be disappointed. The full package is $189 ($49 base +$29 for the digital download and an additional $79 for the DVD +$29 for the printable syllabus). I purchased this program in 2017, but the new version they are selling (version 4) was written in 2009. Unfortunately, the DVD only teaches you how to use their software, so unless you’ve purchased that too, there is very little for the parent to learn. The software is locked, and you’ll need a password to open it. Once open, you can make a total of only 8 transcripts. You can buy another 8 attempts for $49 more. Their software operates offline, so no updates to their product are available, and you’ll have to save your files to your computer. Again, computer technology since 2009 has changed significantly, so it’s a shame that they haven’t moved their product to a web-based platform. As a result, you’ll not be able to use the program if you have Mac or a mobile device. It only works (properly) on Windows 98 or Vista, and there isn’t a mobile app, so you’ll need a desktop computer. My advice, this is an extraordinarily expensive product for something that you can do for free on a dozen websites. This article appeared in Inside Higher Education on September 11, 2017. While the student was NOT a homeschooled student, the article stresses that “anyone” can create a homeschool transcript and pose as a homeschooler. (Imagine that? For years homeschoolers couldn’t get into college and now students want to pose as homeschoolers! We’ve come a long way baby!) Still, I suspect that stories like this may become more frequent, and my advice to you is to maintain a file of curriculum content – books, titles, writing samples, workbooks, catalog course descriptions, print out of certificates, etc. Anything that might help you provide verification if it’s necessary. It probably won’t be, but better safe than sorry. That folder is for you – and won’t be part of their application package or written on their transcript, but don’t trust your memory, start a file today. Revoked admissions offer by University of Rochester raises questions about lack of oversight of transcripts from homeschooled students. Experts see the real risk is lack of information about curriculum, not fraud. When word spread that the University of Rochester revoked an admissions offer from a student who lied about her high school background, many were stunned by the story. The student had attended a private high school, but she submitted a transcript that said she had been homeschooled. Only when she boasted on social media that she was about to enroll at Rochester, and someone at her high school realized it hadn’t sent the university any information about her, was she caught. Comments on the Rochester article suggested that anyone could create a homeschooler transcript, for a student real or imaginary and with grades real or imaginary. So I tested that, creating a transcript for my childhood pet, a cat named Thomas. I paid $19 to an online service, which got me not only the transcript but a water mark for my faux home school (the name reflects my childhood neighborhood). I followed standard courses for the first three years of high school and added activities that reflected Thomas’s interests. The Social Security number listed (at right) might have been a clue that the student wasn’t real. No verification of any kind was required. I wrote to Transcript Maker, the service I used, to ask about authentication, and the company wrote back to say that some parents take the transcript to be notarized, but the company provided no information on actual authentication, and asked no questions (except for my credit card number) as I created the transcript. In fairness to the company, its competitors appear to do the same thing — let anyone create a transcript, no questions asked. So if Rochester received a fake transcript, and one can easily create one, is that a major risk with regard to homeschooled applicants? The issue matters as the number of children being homeschooled has been going up. An Education Department report in 2012 found that the number of homeschooled students was about 1.8 million and increasing. Tom Green, associate executive director of the American Association of Collegiate Registrars and Admissions Officers, said there is good reason for admissions officers to give scrutiny to homeschoolers’ transcripts, but the real issue isn’t complete fraud, as in the Rochester case. “I always go back to the question of how often does someone really lie in admissions,” Green said. It may happen, but it’s “pretty rare,” he said. The more common issue is doubt about whether the grades assigned in homeschooling “reflect what a student would have received in another environment,” Green said. “The fact is that there’s no independent vetting, and that allows for” grading that may not be accurate, he said. This need not be malice, he said, but just the reality of grading without context or comparisons. At the same time, Green stressed that over the years in admissions on campuses, he saw many homeschoolers who were well prepared to succeed in college. Green said that colleges should treat a homeschooler’s transcript much the way they would a transcript from a public or private high school that hadn’t previously been represented in the admissions pool. In the case of a high school, an admissions officer would go online and do some research about the high school, the rigor of its programs and the range of grades awarded. Green also said that he paid more attention to SAT or ACT scores with homeschoolers than with others, and that he would recommend that admissions officers do so, even in cases where colleges are test optional or intentionally limit the impact of test scores. Some colleges urge homeschooled students to submit SAT II (subject matter) test scores, even if these are optional for other applicants. He said that when he compared test scores to homeschoolers’ transcripts, sometimes the test scores were consistent with what one would expect to see with a certain grade point average. But other times, he said, the test scores were well below what one would associate with the GPA reported on a homeschooler’s transcript. And that called for more scrutiny and, in some cases, rejection, he said. Lori Dunlap is a homeschooling parent and advocate for homeschoolers. Her new book, Home Education to Higher Education: A Guide for Recruiting, Assessing and Supporting Homeschooled Applicants, was published in June. Dunlap said she was concerned the Rochester incident would give homeschool transcripts a bad reputation, and she said it was important to note that the woman in that case was not in fact homeschooled. She acknowledged that there is no verification for a standard homeschooling transcript, which relies on the instructor, typically a parent. But Dunlap noted that many homeschool parents supplement their instruction with programs offered by museums or other institutions. 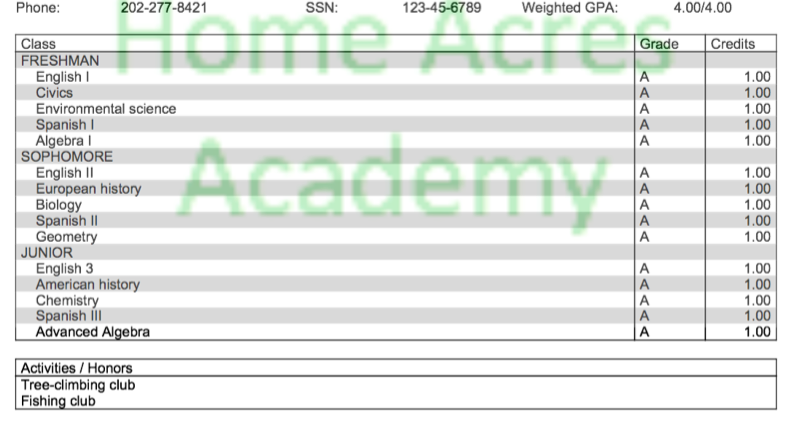 So a homeschool transcript may include grades or certifications awarded by someone who is not the primary instructor or parent of the student. Dunlap said that she advises homeschool parents to keep detailed records about the curriculum used and to provide information to colleges. In many cases, she said, the curriculum is more rigorous than what one would find at many public or private high schools. At the same time, Dunlap said that colleges should not rely too much on standardized tests in evaluating homeschoolers’ applications. Some homeschool parents have their children take many standardized tests as a means of showing what their children can do. But Dunlap noted that one motivation of parents for homeschooling is a belief that public schools spend too much time on testing. These parents, she said, very intentionally (and for educational reasons) try to minimize testing. This creates “an interesting friction” in evaluating homeschooled applicants, she said. “If you have that same student with a much lower SAT score” than a transcript would suggest is appropriate, “the question is if the transcript is wrong or does this student not test well?” Dunlap said. Many homeschoolers are the latter, and should not be denied admission, she said.